Italian scholar; flourished at Rome in the second half of the fifteenth century. His Jewish name is unknown. About 1486 he lived at Fratta, near Ferrara, in the house of Count Johannes Pico de Mirandola, whom he instructed in Aramaic. Flavius was charged by Pope Sixtus IV. with the translation into Latin of some cabalistic works (thirty-eight fragments in Vatican MSS. Nos. 189-191). He furthermore translated into Latin Maimonides' epistle on resurrection, Levi ben Gershon's commentary on the Song of Solomon, and Judah's "Ma'amar ha-Hawayah ha-Heḳḳeshiyyah," or "Sermo de Generatione Syllogismorum Simplicium et Compositorum in Omni Figura." He seems not to have known that the last-named work was really written in Latin by Ægidius, and that Judah was only the translator of it. 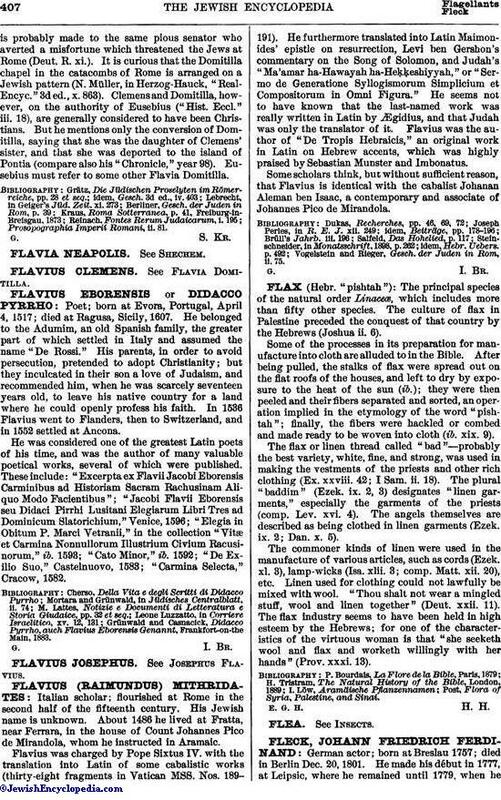 Flavius was the author of "De Tropis Hebraicis," an original work in Latin on Hebrew accents, which was highly praised by Sebastian Munster and Imbonatus. Some scholars think, but without sufficient reason, that Flavius is identical with the cabalist Johanan Aleman ben Isaac, a contemporary and associate of Johannes Pico de Mirandola. Vogelstein and Rieger, Gesch. der Juden in Rom, ii. 75.